It's championship week! The most important week of the fantasy football season. For many of you, the decisions you make in Week 16 can be the difference between hundreds of dollars and zero. With Antonio Brown out, Aaron Rodgers back to the IR, and Ezekiel Elliott returning, a lot of championship teams could be looking towards the wire for their lineups this week. Let's get into it! All players on this list are owned in under 40% of Yahoo! leagues. With a few exceptions, previously listed players will not appear. Kerwynn Williams (35% owned) - Adrian Peterson has officially been placed on IR, ending his season. The next man up? Kerwynn Williams. Williams has seen an average of 18 touches in Adrian Peterson's absence, and would've seen more last week if not for a minor quad injury. The Cardinals play the New York Giants in what should be a low-scoring game. The Giants are allowing the 9th most fantasy points to running backs this season. Williams's touches are enough to use him as a FLEX, and a touchdown would push him into the top-20 scorers. Peyton Barber (34% owned) - It's not often you find a workhorse back on waivers, but that is what you've got in Peyton Barber. Though he struggled last night against Atlanta, he was constantly on the field and saw 16 touches. The Buccaneers were constantly playing from behind, limiting Barber's rush attempts. However, he still rushed for over 4.0 YPC. Assuming Barber starts again, he's a FLEX option. Nick Foles (28% owned) - Last week, my QB streamer of the week, Blake Bortles, did really well. He finished the week as the 5th highest scorer with 25.0 points. This week, it's Carson Wentz's replacement, Nick Foles. Foles actually outscored Blake Bortles last week by 0.5 points. Foles was always a good quarterback, but he got Jeff Fisher-ed with the Rams. Last time Foles played the Oakland Raiders, he passed for 7 TOUCHDOWNS! Foles is your #1 Aaron Rodgers replacement and a top-12 option for the week. 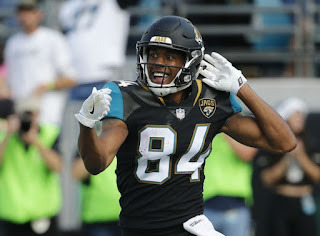 Keelan Cole (8% owned) - Last week, Jaguars WR Dede Westbrook appeared on this list alongside QB Blake Bortles. After last week's performance, it looks like I may have gotten the wrong WR. Westbrook caught just 2 passes and took a backseat to Keelan Cole, who had 186 receiving yards and a touchdown. That's three straight weeks with a touchdown for Cole. Cole is very fast out of the slot, and has capitalized on nearly all of his opportunities this season. Jacksonville faces San Francisco this week, who should stay competitive but poses no threat on defense. Like it or not, Cole is a top-30 option this week. Chicago Bears (26% owned) - Come on now. Did you expect anything less? Of course I'm going to recommend the defense playing the Browns. DeShone Kizer just loves to throw INT's. Chicago's actually been playing tough defense lately, scoring over 13 points in return yard leagues every week since the bye. Don't get cute; pick up Chicago!